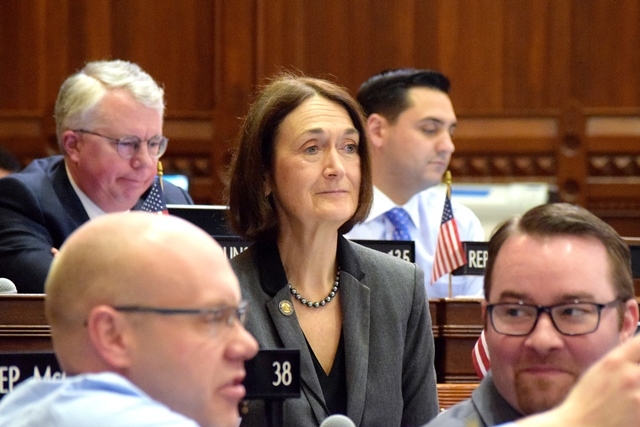 HARTFORD — State Representative Holly Cheeseman (R-37) has proposed more bills to Legislative leaders; this time, they concern our students and public health policies. House Bill (H.B.) 5074: Would reduce costs to school districts related to the mandatory behavior management training required of school personnel. H.B. 5078: Would remove duplicative reporting requirements on school districts and require the Department of Education to develop a database for boards of education to communicate with one another. H.B. 5079: Would eliminate unfunded mandates on school districts. H.B. 5086: Would create an incentive grant program for school districts to regionalize their transportation services by providing funds for them to purchase vans. H.B. 5087: Would permit a school district to reduce its minimum budget requirement in an amount that reflects any actual decline in student enrollment. H.B. 5113: Would require public and private institutions of higher education to establish a policy regarding free speech on campus that is in accordance with federal and state constitutional protections. H.B. 5050: Would establish a drug docket pilot program in New London County (referred to the Judiciary Committee). H.B. 5343: Would help counter the ever-increasing costs of prescription drugs by redefining “third-party administrator” to include pharmacy benefits managers (referred to the Insurance Committee). H.B. 5740: Would permit municipalities to regulate handicapped parking spaces to ensure the availability of ample handicapped parking (referred to the Planning & Development Committee). For more information on these bills, go to www.cga.ct.gov. In the “Quick Bill Search” bar at the bottom of the page, type in the bill number and click “Go.” For contact information on sending testimony to a specific Committee, from the homepage click the “Committees” tab at the top and then select that committee.